"Roberts is certainly successful in conveying a sense of the rich diversity of biographical research. This is a book based upon a formidably wide-ranging bibliography together with his own, by no means insignificant, contributions to the field...[the]...reader will be left in no doubt as to the central importance of biographical research and of its legitimate position within the social sciences" - David Morgan, Emeritus Professor of Sociology, Manchester University (former President, British Sociological Association), Auto/Biography, a BSA Study Group journal, 2002. * What is biographical research? * Why has it attracted so much interest? * How can biographical research be carried out? Biographical Research reflects a rapid expansion of interest in the study of lives taking place within the social sciences. Life story, oral history, narrative, autobiography, biography and other approaches are being used more and more to explore how individuals interpret experiences and social relationships. This book examines the methodological and theoretical developments associated with research on lives in sociology, oral history, ethnography, biography, and narrative analysis. The author includes numerous examples of biographical research from his own work and other studies, and addresses important areas such as the collection and interpretation of materials, uses of biographical research, oral and written accounts, the interview relationship, the construction of the story, memory, audience, and the researcher's own biography. In conclusion it draws out common themes and emerging concerns. 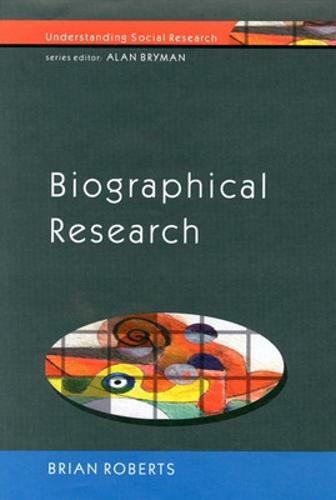 Biographical Research is a comprehensive guide to major issues in the study of lives for students and researchers in the social sciences and related fields.